By combining the qualities of high performance with that of value, the Denon AVR-S720W provides you with an experience unlike any other. The latest AVR-S720W is unlike any other device of its class and impressively delivers vibrantly amazing surround sound filled with the best of 3D audio formats. We found the prospect of connecting a 5.1/5.2 surround speaker system with the AVR-S720W to be both creative and interesting. Connect an additional pair of overhead or Dolby Atmos powered elevation speakers, and this combination will allow you to derive the very best of experiences in 3D Soundspace. We found this combination to be a spectacular channel for listening to the best Hollywood blockbuster tracks and the best songs a well. Continue reading our Denon AVR-S720W Review to explore more. We found the AVR-720W to be formidable in terms of specs as well. The fact that it entails an advanced version of the quad core 32 bit DSP Processor, augmented by a 24 bit/192-kHz D/A conversion capability on all channels is evidence to the exceptional capacity that the concerned device entails. The AVR-720W manages to provide high power, thanks to the high current output devices that it utilizes. These devices are rated at a maximum output rate of about 165 watts per channel and also show the ability to endure 4 ohm low impedance speakers. 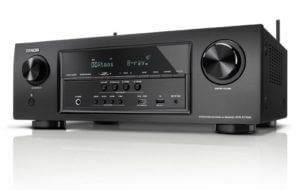 The Denon AVR-S720W is a most versatile device and allows you to listen to a wide range of audio formats. It can play high-resolution tracks in formats of AIFF, FLAC, WAV and ALAC lossless file types. What we found impressive was the ability of the AVR-720W to play these files up to a resolution of 24-bit/192-kHz. AVR-720W even provides you with the opportunity to listen to high resolution 2.8/5.6-MHz DSD tracks (For those of you who don’t know, DSD is the audio format related to SACD). While AVR-720W is adept at playing a wide range of audio formats, it still manages to remain retro in a convenient matter. The fact that it plays files in plain old MP3 format is corroboration of this fact. Another feature that appealed to us was the Audyssey MutEQ automatic room acoustic measurement as well as the Audyssey Dynamic Volume and Dynamic EQ built into the AVR-720W. With these features built into it, the AVR-720W manages to ensure optimum matching of the speaker system in pertinence with the room where it is being played. Unlike the methodical and generic channel based coding, the AVR-720W comes equipped with new indulgent sound formats that allow sound designers to place acoustic images anywhere in the 3D Soundspace. 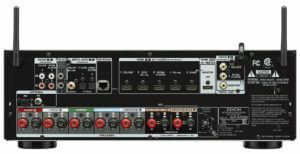 In addition to all of these features, the addition of the Dolby Decoders like TrueHD, Dolby Digital Plus and Dolby Digital truly make the Denon AVR-720W a device worth owning. All in all, the AVR-720W is a device well designed and endowed with the most impressive of features to make it a win in its concerned department. This is one gadget that you must possess, trust us. We highly recommend this device, especially in large part due to the inclusion of Dolby Atmos and DTS: X and the wide range of media formats that it can play. Also, thanks to then superb sound that it emanates, and the quality of the latter, we endorse it quite highly.